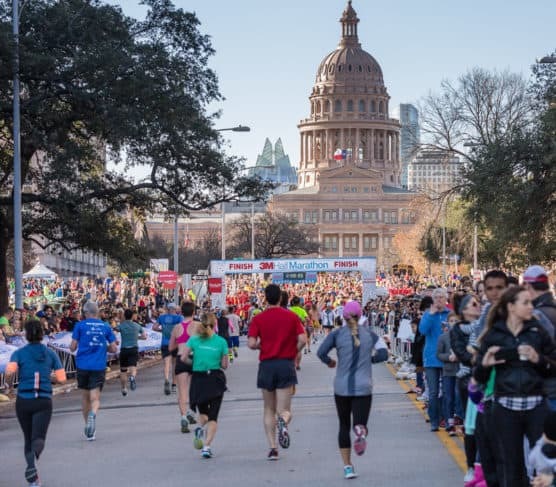 As many as 7,000 runners take to the streets and neighborhoods of Texas’s capital city of Austin for a long, straight and mostly downhill race each year, as the city’s 3M Half Marathon gets set to mark its 25th annual running in late January 2020. Though it’s definitely a hilly race, most of the hills are downhill in this point-to-point event, which descends from a peak elevation of nearly 900 feet above sea level near the start of the race to a low of just above 500 feet at the finish line. Fast and scenic, the course for the 3M race starts in the northern part of the city on Stonelake Boulevard, near the Baby Acapulco Restaurant & Cantina. From there, the course winds around Braker Lane, Burnet Lane, Longhorn Boulevard and United Drive, taking runners past local sights like the Austin Arboretum and the Stack Valley Greenbelt. In the early going of the first few miles, the course is hilly but stays mostly at the same elevation, before reaching its first real drop just after the mile 1 marker on West Braker Lane. After the fourth mile, the course begins a downhill stretch along Shoal Creek Boulevard, Foster Lane and Great Northern Boulevard, which parallel the MoPac Expressway. After a brief stretch along Bullard Drive, runners next turn left back onto Shoal Creek Boulevard, for a long winding stretch that takes them toward the University of Texas campus. This is the middle stretch of the race – through mile markers 6, 7 and 8 – and is marked by a few hills along the way, but otherwise a fairly flat, even course. When runners reach the mid-way point between miles 8 and 9, they begin another downhill, turning onto West 45th Street. This stretch brings runners to the final third of the 13.1-mile route, as miles 9 and 10 watch the field turn from West 45th south onto Red River Street, for the final straightaway run toward the University campus and along San Jacinto Boulevard, which runs right through campus. The last four miles feature a steep drop of roughly 200 feet in elevation, and the picturesque UT campus, as they take runners past Mike Myers Stadium and along San Jacinto Boulevard for the finish at the Texas State Capitol. The event gives participants ample view of the full spectrum of what the city has to offer along the course — a mix of funky urban neighborhoods, the unique downtown Austin area and the University of Texas, whose main tower in the center of campus looks out over the entire city. The wintertime in southern central Texas brings a mixture of mild to moderately cool weather conditions to the Austin area, with relatively low precipitation. In January, average area temperatures range between 40°F and 60°F, while precipitation amounts average around 1.89 inches, making January its driest month of the year. On the day of the race (Jan. 19), the average low is 41°F and the average high is 62°F. See the 3M Half Marathon course map here. To reserve your spot in the 2020 running of Austin’s 3M Half Marathon, register online at the event website here. Ever run in the 3M Half Marathon? Share your impressions here, or post your review in the Comments box below.